Many of you may be familiar with WebGestalt, a wonderful web utility developed by Bing Zhang at Vanderbilt for doing basic gene-set enrichment analyses. Last year, we invited Bing to speak at our annual retreat for the Vanderbilt Graduate Program in Human Genetics, and he did not disappoint! Bing walked us through his new tool called NetGestalt. NetGestalt provides users with the ability to overlay large-scale experimental data onto biological networks. Data are loaded using continuous and binary tracks that can contain either single or multiple lines of data (called composite tracks). Continuous tracks could be gene expression intensities from microarray data or any other quantitative measure that can be mapped to the genome. Binary tracks are usually insertion/deletion regions, or called regions like ChIP peaks. 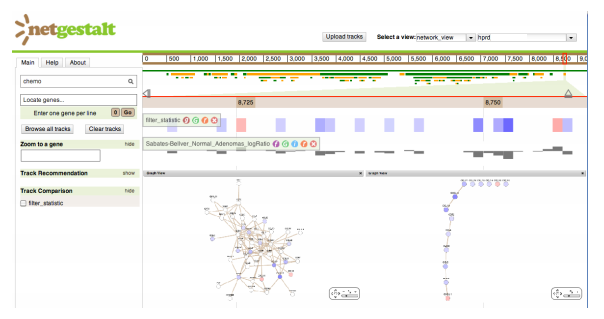 NetGestalt extends many of the features of WebGestalt, including enrichment analysis for modules within a biological network, and provides easy ways to visualize the overlay of multiple tracks with Venn diagrams. Netgestalt provides a very nice interface for interacting with data. Extensive documentation on how to use it can be found here. Bing and his colleagues also went the extra mile to create video tutorials on how to use their web tool, and walk you through an analysis of some tumor data.